India has topped the list of countries which have improved their average download speeds on fixed-line broadband and grabbed the second spot in improvement in mobile internet download speed. Right now India is in the midst of a digital revolution. With some of the lowest 4G data prices available anywhere in the world, more and more Indians are logging online to work, consume media and even shop. But this was not always the case. Internet has had a slow start in India with marginal increase in speed over the years. But that changed when Airtel introduced 4G in India. Compared to the past the data speed improved significantly. But the real revolution began when Jio entered the market. Where previously the data was very expensive and out of reach of most people, Jio came along and started giving away data for free. This triggered a pricing war with companies trying to our-price each other out of the market. Jio’s network is also significant because it is the first 4G-VoLTE network in India and it is the only VoLTE-only network in India. It means that Jio works only on 4G network! Ookla has reported that India has topped the list of countries which have improved their average download speed on fixed-line broadband and grabbed the second spot in improvement in mobile internet download speed. But, do these numbers tell the whole story? Let’s find out. Yes, India has improved the most in broadband download speeds in 2017, beating the likes of China, Japan and USA with a 76.9% improvement. 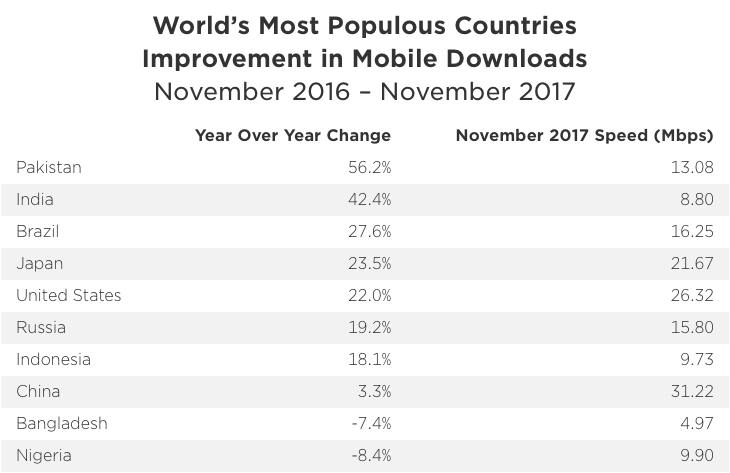 In mobile download speeds though, India came in second behind Pakistan, but ahead of Brazil, Japan and USA, with a 42.4% improvement. But these numbers do not tell the whole story. Take a look at the two tables below. Can you see what is happening? India has achieved these ranks in ‘World’s Most Populous Countries’ category. 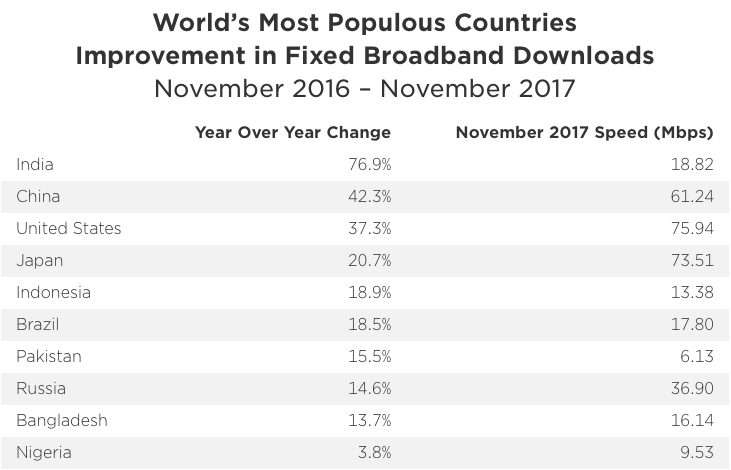 In the overall rankings in terms of improvement in speeds, it was Laos who took the first spot with 249.5% improvement in broadband download speeds. A tiny, little-known island named Reunion took the top spot in mobile download speeds with 141.5% improvement. Globally, internet speed has increased 30% in 2017. How Does India Fare Globally? Now let us look at some raw speed numbers. 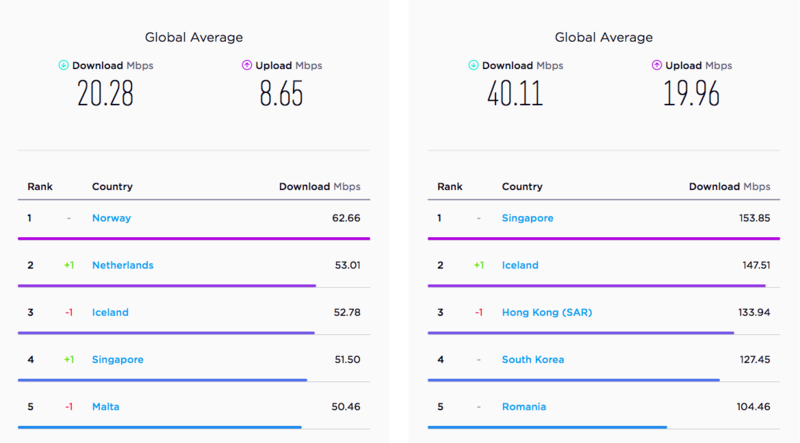 Norway leads by a significant margin in mobile download with speed of 62.66 Mbps, while Singapore leads the way in broadband download with speed of 153.85 Mbps. To put things in a global perspective, India ranks at no. 109 in mobile downloads with a speed of 8.80 Mbps and comes in at no. 76 in broadband download with speed of 18.82 Mbps. These numbers are the stark reality. India still has a long way to go before it can catch up with the leaders. But it is not all bleak. The data in Ookla’s Speedtest Global Index 2017 has been derived from tests taken by real people who use Ookla’s Speedtest app every month. It is interesting to know that Ookla has 439 Speedtest servers in India out of the 7,021 servers globally. "India Tops Broadband Speed Improvement In Ookla's Speedtest Global Index 2017! ", 5 out of 5 based on 1 ratings. Boost For Mumbai Hotels – 20 Licenses Abolished For Ease Of Doing Business!